Look trendy and boho-chic in these pretty shorts. Lace is such a classic fabric, which is why it can be added to pretty much any piece of clothing and look great. 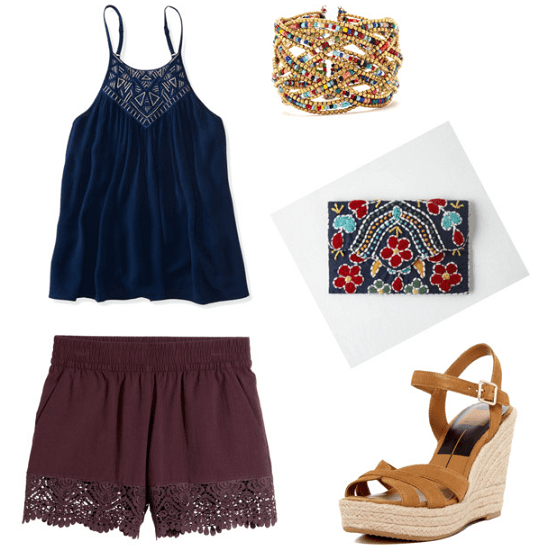 Shorts are no exception, and the lace gives them a touch of bohemian style. Here’s how to wear lace-trimmed shorts for class and a night out. For class, wear your shorts with a comfy tee. This navy shirt looks great with the plum shorts since they’re both relatively neutral colors. Throw on a bucket bag that will carry everything you’ll need for a day of classes. Lastly, put on a simple gold cuff and matching sandals. A fun embroidered clutch will spice up your look for night. Pair your shorts with a pretty, delicate tank top. Add a beaded multi-colored bracelet that matches your clutch, plus some tan wedges. You’ll look amazing! Do you like to wear lace? Would you wear these shorts? Let me know in the comments!